Pachysandra represents a semi-bush of the family of Buxaceae. 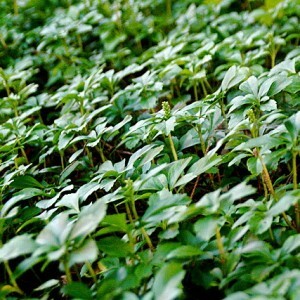 The plant has long rhizomes and upright stalks up to 35 cm high the Homeland of this ground cover plant consider to be China and Japan, where it grew mainly in the woods. In our corner of the world this low semi-bush appeared in the Middle Ages and got accustomed quite well. Thickness of stalks of a plant makes 1 cm, and their dark green leaves have an ovoid form, they rather dense, deckle-edged. Characteristic of this plant – an unusual arrangement of leaves "circles". Each new circle of leaves is a year escape, and all at a plant three circles of leaves. Leaves of the top circle are leaves of the current year, leaves of an average circle are of the previous year, and leaves lower are the two-year-old.